A limit can be placed on the number of submissions a form receives. An expiration date can also be set for the form. On this guide, we will only focus on 3 of the 5 options. The other two options which are Enable and Disable were explained on a separate guide: How to Enable/Disable a Form? This allows you to set your form to be disabled on your preferred specific date and time. 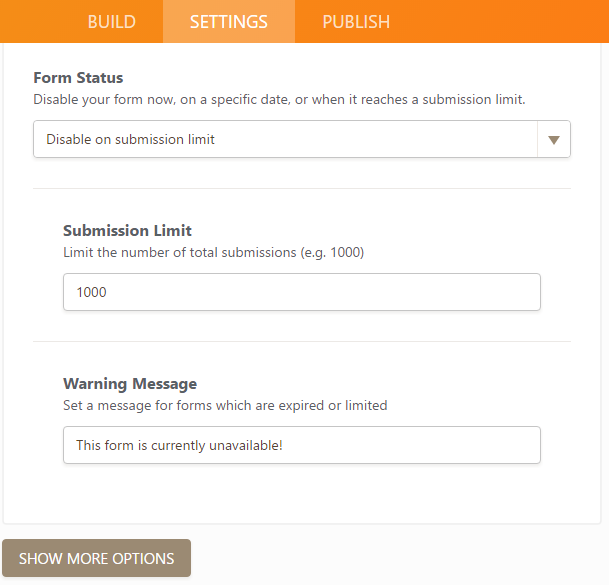 This allows you to set a specific total number of submissions allowed for your form. This allows you to set an expiration date and time to when your form is only allowed to be submitted and, also, set a specific total number of submission allowed during that time frame. The form whose Preferences is shown in the screenshot above was set to be disabled either upon receiving one thousand (1000) submissions or at 4:14 PM on 2017 March 21, whichever comes first. -A drop-down calendar is used so it will be easy to set an expiration date and also to avoid confusion with the different date formats. -Time must be entered at least 5 hours before the expiration time (if the expiration time is at 17:00 the expiration time must be set a minimum of 5 hours before it and which is 12:00). The instant a form reaches its submission limit and/or expiration date it will become disabled. Example 1: You would like to allow 10 more submissions. Increase the submission limit to 260 (250 current submissions + 10). Example 2: You would like to remove the submission limit altogether - change the form's status to Enable. Example 1: You would like to change/update the expiration date to 3:30 PM on May 18, 2016. Using the calendar drop-down set a new future date of expiration and set a time on the time field as well(Setting the time to 00:00 will disable the form as soon as the date entered is reached). 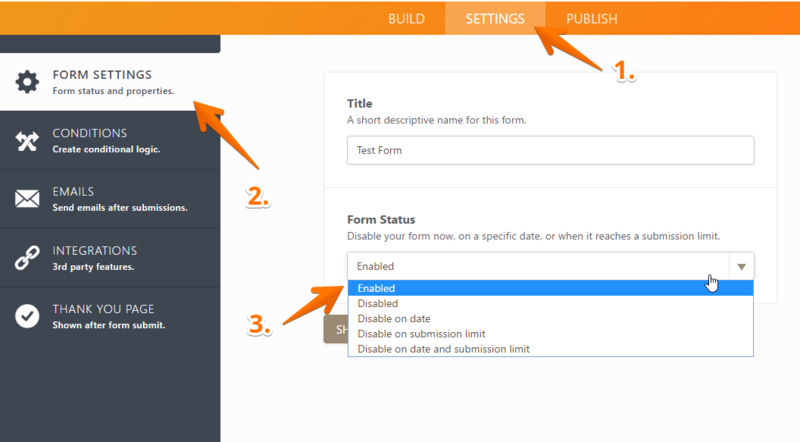 Example 2: You would like make the form with no expiration date - change the form's status to Enable. Use the examples in the previous scenarios as a guide, according to the change you wish to make. How can I create such a form? What happens when the Submitted limit has reached and then 1 submission is deleted. Will the counter reset. e.g. Your form had a submission limit of 25 and the form did get 25 submissions. Now the new status of the form will be disabled. Now one of the admissions have backed out, so you go in and delete a submission. Will the counter adjust to accept one more submission? I would like to limit the number of submisisons per choice. Is this possible? I am using the Quiz app and I would like to limit the number of submissions originating from a specific email. Do the settings allow for a person to do that? Is there a way to limit the number of responses per month? i.e. one of my forms (for budget reasons) we only want 50 responses each month. On the first day of each month, we'd like to go back to resetting the submission amount to zero. I use the Forms as an entry to our dog events for our club. We often have 2-6 potential classes that an exhibitor can enter. So, lets say I have 2 classes entered on a form. I need to know when the grand total of classes entered is 30. How do I or can I set up the "Disable" function to reflect that we have a total of 30 entries instead of 30 submissions? But, sometimes a competitor will only enter 1 class while the next competitor will enter 2-4 or more. Is there a way to do this? Can I limit submissions on each option? In Each slot Maximum of 20 people will be taken in one slot. Please help me out how to do it. If everything works i will buy it. Is there a way to limit number of submissions per week? Thank you. hello ... while setting up the booking form.... if one person as selected a particular time in a given day... how to limit that the next person who takes the same time , should not be able to select the same time ?? How can I limit 3 submitions per User? Hi - I'm trying to set a form to disable at a date and time. I (and all of my users) live in Australia (Adelaide). Do I need to calculate the time to be US Eastern Standard Time, or can it be the time zone that my account settings are set to? I've tried testing this tonight but it still appears to be available. I don't seem to have the Preferences button on the top toolbar at all. Am i missing something? 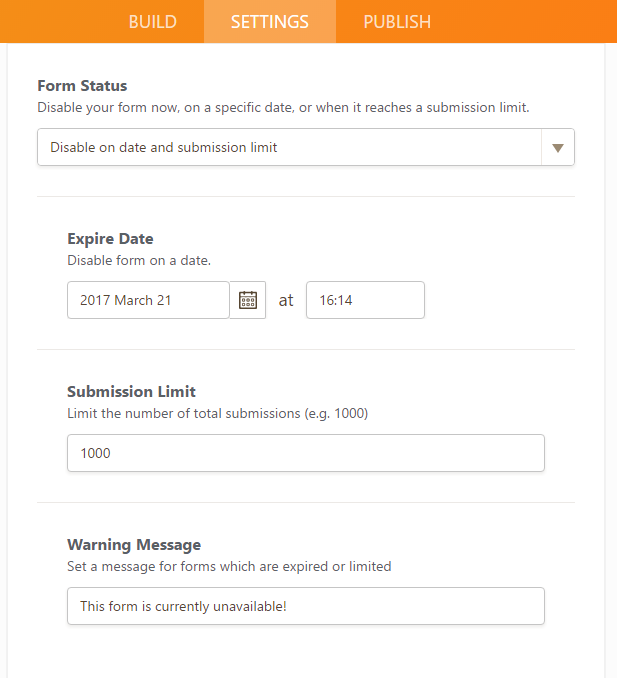 Is there a way to show the warning message before filling in the form when the form has reached the limit of submissions? Is there a way to limit the form by views? So, for example, someone can open the URL / view the form 10 times, after which the limit is reached and the form can't be viewed anymore? Is there by any chance a limit of how many submissions can be made per day, week, or month? I'd like a cap which resets after a time. My form has four dates the user can select from and each date needs to have a limit of 15. These are workshops. Once 15 of our employees has selected a date/location - that option should close and not allow anymore to sign up. However, the other 3 dates/times should remain open until they also have 15 sign ups. How can I accomplish this? Is there a way to limit by submissions AND date. For example, I only want 20 submissions for each date, and there are three different dates. How do I do that? As of today at this time, I don't see the area to set the submission limit under Preferences with the new interface, please check and instruct. Is there a way to limit the number of submissions in a calendar month? ie You can submit 15 submissions through this form in the month of January; another 15 submissions in the month of February; another 15 submissions in the month of March without having to manually reset/extend the parameters at the end of each month? Is it possible to set a limit based on the number they select in a certain field on the form? For example, I would like to cap my event at 60 people, but am allowing multiple people to register per registration form. is there any way to set limit/quota for each choice in multiple choice question? Is there any way to set limit for each answer? So, if I have 4 seats available at 9am, once 4 payments are processed those seats are booked and they will get a message saying "this trip is full"
How can you set it so they can book a seat on the next trip which is at 12pm? Is there a way in the warning message to embed or ?? so that they are redirected to a second form that puts them on a waiting list? Being able to set a submissions limit is great, but it doesn't work perfectly. My form, to register a limited number of people for an event, asks users to pay a fee via PayPal and they're directed to PP after they click Submit. It seems that JotForm counts toward the submissions limit any instance that the form is filled out and the user clicks Submit -- regardless of whether they completed the PP transaction. For example, I embedded the form on a web page, so when someone reported an issue I sent test submissions sans PayPal payment from four different browsers. What makes this even more frustrating is that after resolving the user's issue, I deleted my test submissions from the "incomplete payment" area, thinking that would ensure they wouldn't be counted toward the limit. What time zone is used? How will I know that 17:00 hours is 5 pm MST or 5 pm CST or 5 PM EST, etc. I am in MST time and need the form to turn off at 5 pm. Is this feature not working? or not available for free plan holders? This feature completely failed to work for me. I set a limit of 148 submissions on a form, but the form kept on receiving submissions into the 150s before I realised and manually cut off access. Is there a way to set limits on options. For example, 10 people can submit option 1 and then option 1 will be disabled, not the entire form? Please, oh please reimplement this OR supply alternatives for achieving a similar effect manually. You guys really need to get this feature back in JotForm! Its the one thing missing from this great script! Not having this feature is really making things more difficult for me. Can you give some idea when this will be back? Is there still no update on it? There are a number of variations on this theme. The original intent was to close a form based on previous number of submissions or date. I'd like to limit submissions within a field and display a message, e.g. "This course is full, you are on a wait-list" but still permit the other fields to be completed. Ditto the above. We really need this ability. Although we will deal with the lack thereof. But please hurry. Not having this feature is a deal breaker. I am forced to use competing form builder sites which have this feature and Google Doc integration implemented. I will return when JotForm is back on par with the competition. Any chance we have this feature working in the near future? Thanks! Trying to avoid people entering duplicate records in the form, how do i do this? Is there a way to get on a notification list so that when this feature is activated we will know? Can the time free be estimated when the feature will be back up? 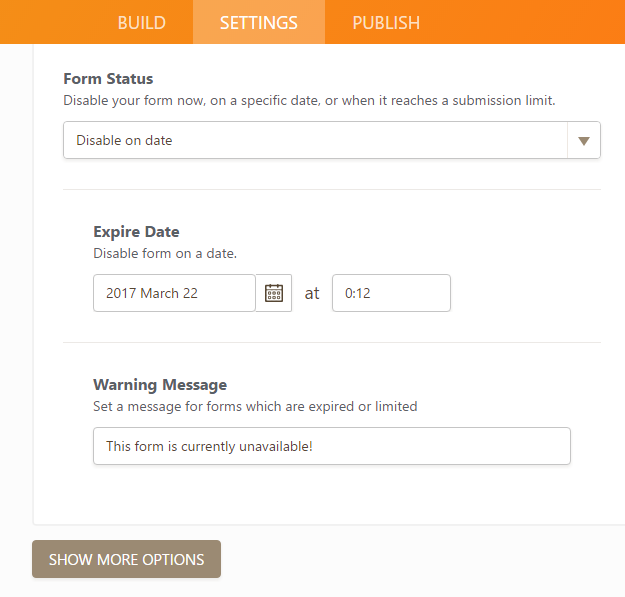 We are thinking of moving all of our forms from other form builders to jotform, but rely on being able to add some kind of deadline. Thanks. How to allow applicants to save information of incomplete application? Form Limits ... Expiration Date ... Does One have to agonisingly type in the date and time? Over submission limit - how to get my other forms back online.